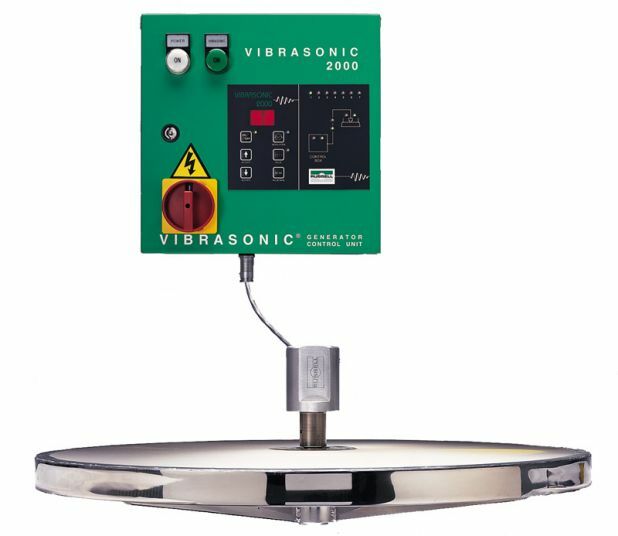 Traditionally the Ultrasonic Sieve Deblinding System, also known as the Vibrasonic® Deblinding System (VDS), is used for eliminating the blinding and blocking of sieve mesh. Mesh blinding or blocking can occur when inherently difficult to sieve products, for example metal powders, are small in particle size and/or have a sticky nature. This can cause the material to build up on the mesh which could comprise product quality and throughput. This Ultrasonic Screening System applies an ultrasonic frequency to the sieve mesh. The frequency of the vibration breaks down surface tension, effectively making the stainless steel mesh wires friction-free and preventing particles from blinding or blocking the sieve mesh. For more information on how Vibrasonics® can eliminate mesh blinding read our blog post the purpose of Vibrasonics®. In addition to providing accurate separation down to 20µm the Ultrasonic Sieve Deblinding System for vibratory screeners can also be used to increase throughput. When space is restricted but there is a need for a high throughput rate the Ultrasonic Sieve Deblinding System provides the ideal solution. By applying an ultra high frequency vibration through the mesh wire the material being sieved is fluidised causing it to pass through the sieve mesh quicker. When combined with the lower frequency vibration of the vibratory sieve it is common to double the throughput of many products. Read this white paper for a indepth understanding of the power of ultrasonics within the powder processing industry.